Generation Z (Gen Z), ranging in age from 15 to 24 is emerging to assert itself on the future of the United States. A majority of Gen Z is now in college, or recently graduated, with some advancing straight into the workforce. Gen Z spends up to nine hours a day engaged with digital media. They keep current with news events primarily from social media. Their social media platforms of choice are Snapchat, Instagram and Twitter. Gen Z represents an inflection point of how news is distributed and consumed. Although Snapchat is Gen Z’s second most popular social media platform, it is the most used source for news information in this age group. Snapchat was created as a picture-based messaging app. It has evolved into an extensive social media platform that connects 200 million people around the world every day. The format, a ten-second picture or video message, has expanded rapidly. Along with messaging individuals, the app now hosts video and audio calls, and creates “stories” that friends can view over a 24-hour period. Two added features called “Live Stories” and “Discover” have elevated Snapchat into Gen Z’s most popular news platforms. Live Stories has been active for five years. This feature allows a story to be posted publicly based on location or event. An event, like Hurricane Harvey for instance, may include Snapchat videos and pictures posted by individuals in the area of the hurricane. During Hurricane Harvey, Live Stories were used frequently to track the storm’s damage and receive updates. Discover is a feature that was added in January 2015 that transformed Snapchat into a functional news site. The Discover section is dedicated to companies and news outlets that publish news and marketing information on a regular basis. Organizations can now share news information through the typical 10-second Snapchat format. At the bottom of these posts, users are often invited to “tap here” for links to more in-depth articles, or longer videos. The articles are often copied from the news organizations’ website and inserted into this section. Research indicates that about 44% of Gen Z Snapchat users use the Discover feature daily, and 30% used this feature as their primary information regarding the 2016 Presidential election. With 400 million daily users and 1 billion total users, Instagram is far larger than Snapchat. Only Facebook and YouTube boast a higher volume of more users than Instagram. Almost 80% of Instagram’s young audience is outside the United States. 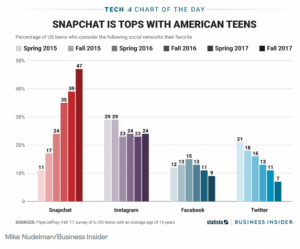 Instagram also rates higher than Snapchat with an even younger crowd between the ages of 13-17. Research shows 63% of that age group visit Instagram daily, compared to 54% for Snapchat. Twitter is a powerful social media platform used by multiple generations and Gen Z is no exception. Twitter, with 400 million daily users worldwide, 68 million in the US, is the second most used source for Gen Z’s news. The audience for Twitter is a bit older than Snapchat. About half of Twitter’s users are between 25 and 44 years old. Twitter’s popularity is grounded in the constant stream of updated material that is posted daily. Gen Z members navigate a post from a news source by looking for two features that lend credibility. Verified Accounts: Having an account “verified” puts a small blue check next to your account and labels the account as an official business, public figure, or icon. Gen Z looks to verified accounts for first reports of information and breaking news. Attachments: Some verified accounts also link the user from Twitter to the source of the article. For breaking news, Twitter is “trending” page is a good resource to follow developing news. The Trending page shows the most tweeted subjects in a certain period of time. During a big news event, the Trending page will be flooded with multiple news articles from various outlets and first reports from verified accounts. Users have access to dozens of news websites’ most recent information all compiled in one place. Generation Z is entering the workforce and putting its stamp on American society. Their information consuming habits are grounded in social media platforms. Having a social media platform to connect with this emerging and influential demographic is essential for any business to build its brand. Taking that next step into a modern approach to social media can be the advancement you need. Channel Communications, located in Towson, Maryland, is a full-service marketing solutions company. We can do it all – print advertising, brand identity programs, direct response, content marketing, video communications, websites, social and digital marketing.